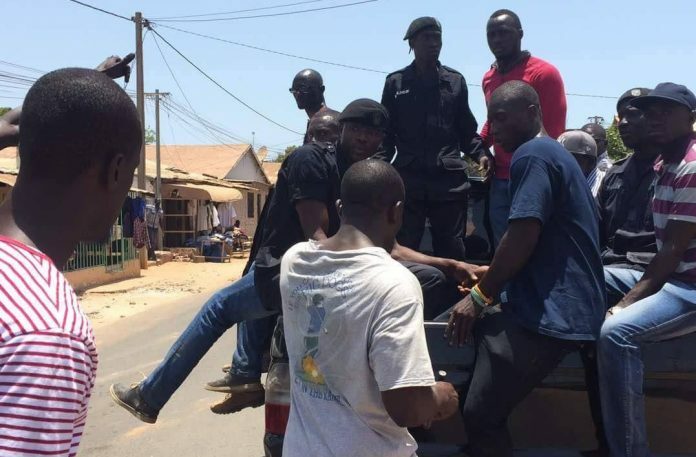 BAKAU – Drug squad agents’ yesterday afternoon clashed with dozens of young boys in Bakau, following a raid on cannabis in the coastal town. The agents who arrested a number of alleged weed smokers, were stoned, insulted and met with stiff resistance as they attempted to drag away the arrestees out of town. Dozens of young men including women, chased them away from Farokono to the Garba Jahumpa road in Newtown, injuring a number of agents, who were dressed in civilian clothes, including PIU officers. One of the raiders, one Beyai, had a bruise on his face. He told The Standard the boys were attacking them because of the arrests they made. Another officer’s trousers was ripped apart. But one Tabora Bojang, who looks on as the melee continue, claimed the agents were brutal, as they used tear gas on the crowd and wrestled one man to the ground. “When one of them released a tear gas into a young man’s face, another officer came and knocked him hard, followed by another,” he said. One of the agents could be heard shouting at the crowd “come back if you are man enough.” Others joined to stone back as well. At least, three people claimed their phones were forcibly taken as they tried to shoot the disorder as it unfolds. One of them was Baba Manneh, a shop-keeper in Newtown. Yankuba Janneh, another Bakau native, blamed the boys’ behavior. “These officers were only doing their jobs. It is sad people think they can attack them whenever they come to Bakau. The last time they were attacked as well for making arrests. The government should send an army, who am sure they won’t attack. “In this new Gambia, people think they can do whatever in the name of democracy,” he stressed. It is not clear were the arrestees were being taken to.